Microbiology is the branch of biology that studies the growth, structure, development, and other characteristics of microscopic organisms (those usually too small to be seen with the naked eye), including protozoans, algae, fungi, bacteria, yeast, and viruses. 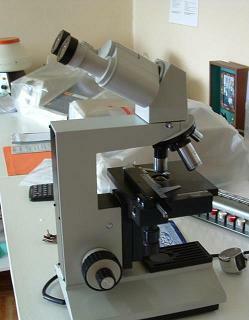 Most microbiologists specialize in a particular application of microbiology. For example, medical microbiologists study the relationship between organisms and disease or the effects of antibiotics on microorganisms. Other applications include environmental, food, agricultural, or industrial microbiology; virology (the study of viruses); immunology (the study of mechanisms that fight infections); or bioinformatics (the use of computers to handle or characterize biological information, usually at the molecular level). Frequently special techniques are required to isolate and grow microorganism, and studies often draw from other fields of science such as microscopy, biochemistry and genetics. Many microbiologists also use biotechnology to advance knowledge of cell reproduction and human disease. Of particular interest to microbiologists is the effect of these organisms on humans, as many are pathogens (disease-producing agents). Therefore, microbiology is closely associated with pathology, immunology, and epidemiology. The word Microbiology comes from the Greek terms micron which means small, and biologia meaning studying life. ↑ 1.0 1.1 Occupational Employment Statistics: Microbiologists by the U.S. Bureau of Labor Statistics. ↑ 2.0 2.1 Occupational Outlook Handbook, 2008-09: Biological Scientists by the U.S. Bureau of Labor Statistics. This page was last modified on 21 June 2010, at 19:33.